Breathtaking Yakuza Tattoo Designs - Picnic! The Yakuza are known for many things, but one of the things they are most well-known for is their unique tattoos. Yakuza members have half body or even full body suit tattoos that cover the body from the neck to the waist, or to the feet. Sometimes the Yakuza tattoos are just on the shoulders, or on back and chest except for a line straight down the front of the chest. Most of the time if you see these types of tattoos the Yakuza members are still getting the tattoos worked on. These amazing full body suit and half body suit tattoos take many years and many tattoo sessions to complete. Some members have their tattoos put on over the course of 20 years or more. 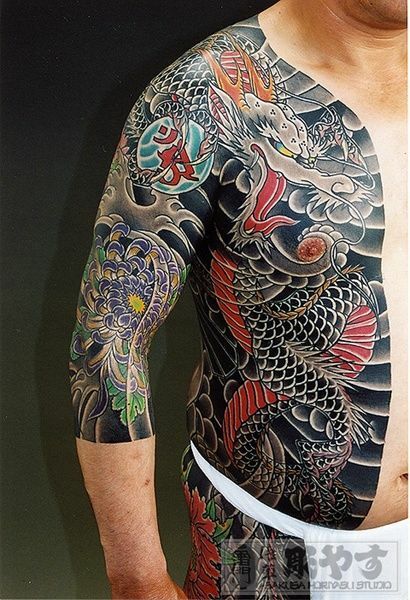 Yakuza tattoos incorporate many of the traditional artistic elements of Japan. Geishas, animals, and Japanese icons like cherry blossoms are all mixed in these stunning tattoos that that recreate the artistic style of another age to keep the tradition alive. The tattoos are also done with traditional tools like sharpened bamboo instead of motorized modern electric tattoo guns. Because of the ancient method of inking the tattoos completing a design often takes years. But the Yakuza uphold old traditions as a way of honoring and remembering the past, even when it wasn’t always pleasant. Tattooing in Japan is much different than tattooing in other cultures. In Japan getting tattooed still carries a strong social stigma so there are not many tattoo artists. Most of the tattoo artists that can be found are found in big cities or near American military bases. The artists who practice Irezumi, the traditional method of Japanese tattoing, are very hard to find because their craft is considered taboo. Many don’t have shops. They work in their homes or in private spaces. Getting an Irezumi tattoo can take years and cost tens of thousands of dollars. That’s because the artists who practice this ancient form of tattooing are masters of their craft. In Western culture someone goes to a tattoo artist, describes what they want, and the tattoo artist will create a unique piece of art for them based on what they say they want. A tradition Irezumi tattoo artist will create incredible art done in a traditional Japanese style but will design according to your body shape and surface and their own artistic muse. While the customer has some input into the design of the tattoo the tattoo artist does much of the design work alone. Designs are not drawn out first and then applied as stencils. An Irezumi tattoo artist will draw the outline of a design freehand on the body and then tattoo that design filling it in as he goes. Irezumi tattoos are painful and take much longer than tattoos in other cultures because they are created using traditional materials like sharpened bamboo or long metal needles attached to bamboo poles with silk thread. Many Irezumi artists mix their own inks to get certain colors. The tattoos are done in a traditional hand poked method where the artist uses simple tools to push the ink into the skin. To the Yakuza undergoing this painful but time honored method of tattooing is proof of worthiness to be in the organization. Only those who are brave and possess great fortitude can stand having sensitive areas of the body tattooed in the painful traditional Irezumi way. In Japan tattoos have never been popular. Japanese culture encourages people to fit in and be like others not to be unique and stand out. Throughout Japanese history criminals who were put in jail were tattooed as part of their punishment. A record of their crimes was tattooed on their bodies as a permanent reminds and a warning to others of what they had. The tattoos were not fully visible but did extend far enough that when a man raised his arms the punishment tattoo would show underneath his kimono sleeves. The Yakuza, a criminal organization, originally started wearing tattoos as both a mockery of this practice and to show pride in their criminal status. In Japanese culture those with tattoos are permanent outcasts, so when Yakuza members get tattoos they affirming themselves as permanent outcasts as well as permanent members of the Yakuza.